Archaeologists working on The Stonehenge Riverside Project have generated large volumes of spatial data, through geophysical surveys and excavations. Bournemouth University’s Google Under-the-Earth: Seeing Beneath Stonehenge integrates this spatial data so that people around the world can see beneath the soil. Researchers at Bournemouth University built the spatial database and added KML coding. This data has now been uploaded to Google Earth for you to enjoy. 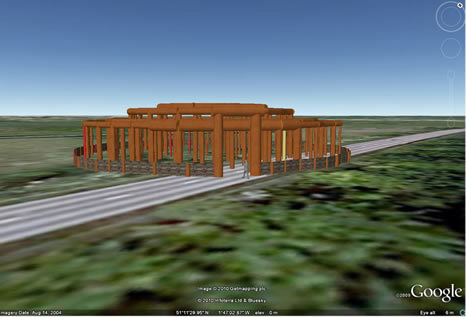 Google Under-the-Earth: Seeing Beneath Stonehenge was created at Bournemouth University by Dr Kate Welham, Mark Dover, Harry Manley and Lawrence Shaw. It is jointly directed by Dr Kate Welham and Professor Mike Parker Pearson at the University of Sheffield. It is envisaged that Google Under-the-Earth: Seeing-beneath-Stonehenge’ could be the start of a new layer in Google Earth. Many of the world’s great archaeological sites could be added, incorporating details of 150 year’s worth of excavations and 20 years geophysical and remote sensing surveys. The Stonehenge Riverside Project was a joint collaboration between Universities of Bournemouth, Bristol, Manchester, Sheffield and UCL. It was led by Professor Mike Parker Pearson, University of Sheffield, and co-directed by Professor Julian Thomas, University of Manchester, Dr Joshua Pollard, University of Southampton (formally University of Bristol), Dr Colin Richards, University of Manchester, Dr Chris Tilley, University College London and Dr Kate Welham, Bournemouth University. This project has been supported by: The Arts and Humanities Research Council, the British Academy, the Royal Archaeological Institute, the Society of Antiquaries, the Prehistoric Society, the McDonald Institute, Robert Kiln Charitable Trust, Andante Travel, Sheffield University Enterprise Scheme, the British Academy, the National Geographic Society, with financial support from English Heritage and the National Trust for outreach. The project was awarded the Bob Smith Prize in 2004 and the Current Archaeology Research Project of the Year award for Bluestonehenge in 2010.